This model is available as an automated tutorial by selecting Model Examples and Tutorials... > Electromagnetics > Spherical Capacitor from the File menu. Or alternatively, follow the step-by-step instructions below. 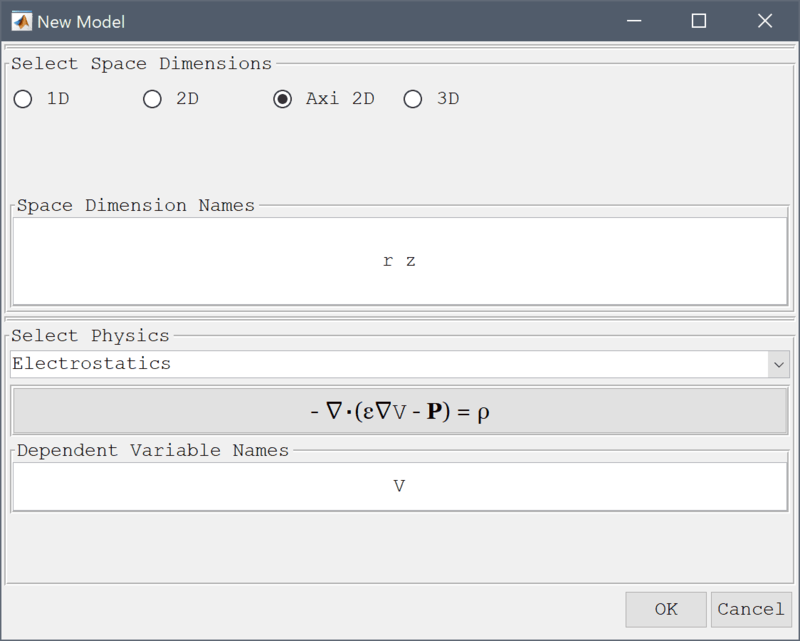 Select the Electrostatics physics mode from the Select Physics drop-down menu. 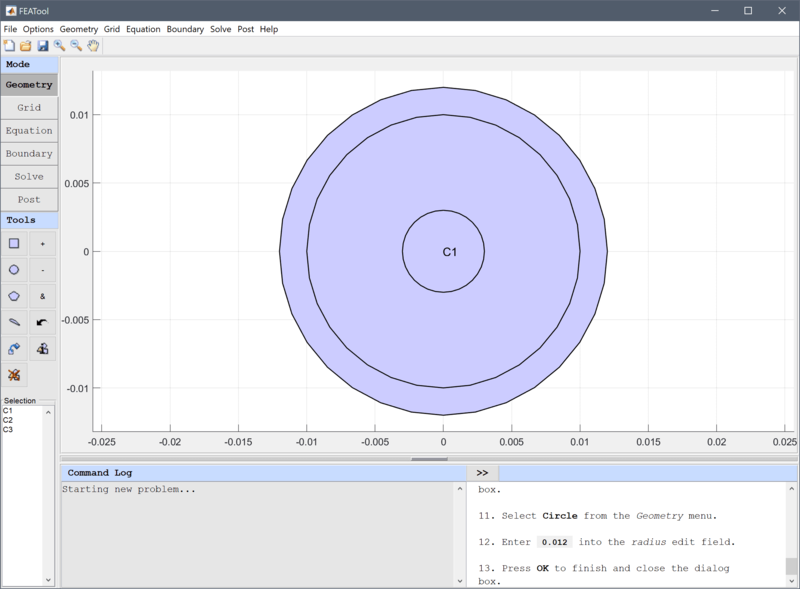 Start by creating three circles all centered at (0, 0) with radius 0.003, 0.01, and 0.012, respectively. Enter 0.003 into the radius edit field. 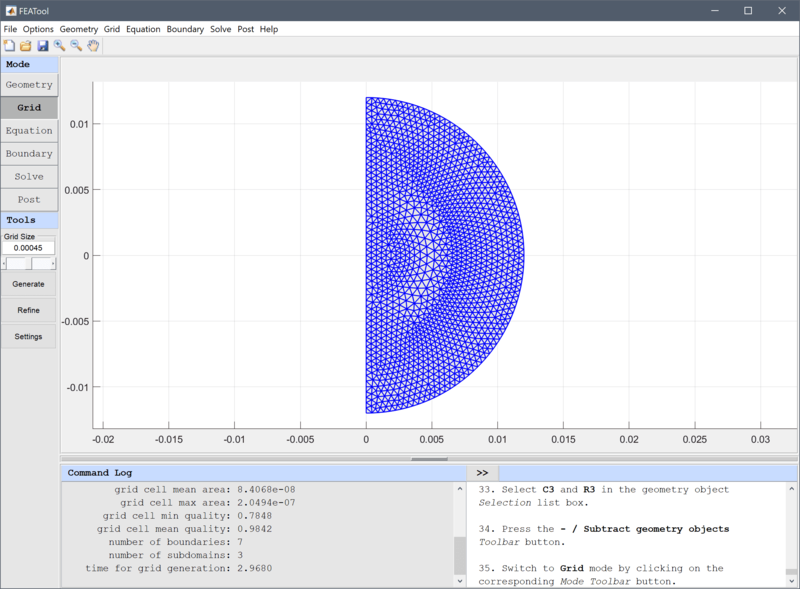 Enter 0.01 into the radius edit field. Enter 0.012 into the radius edit field. Create three rectangles on the left side of the symmetry axis (r<0) so that they cover the left side of the circles (extending a somewhat above, below and to the left). Enter -0.013 into the xmin edit field. Enter -0.013 into the ymin edit field. Enter 0.013 into the ymax edit field. One by one subtract the rectangles from the corresponding circles so that only half circles on right side half plane remain. Enter C1 - R1 into the Geometry Formula edit field. 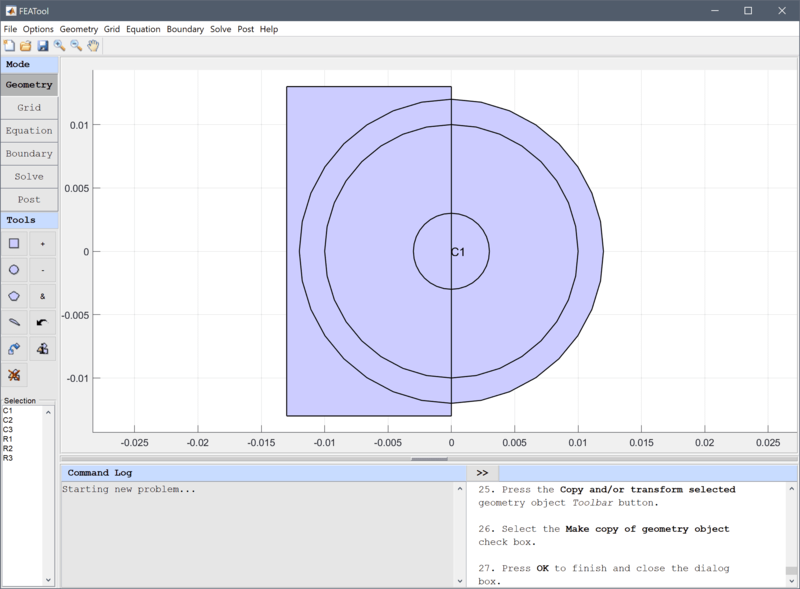 Select C2 and R2 in the geometry object Selection list box. 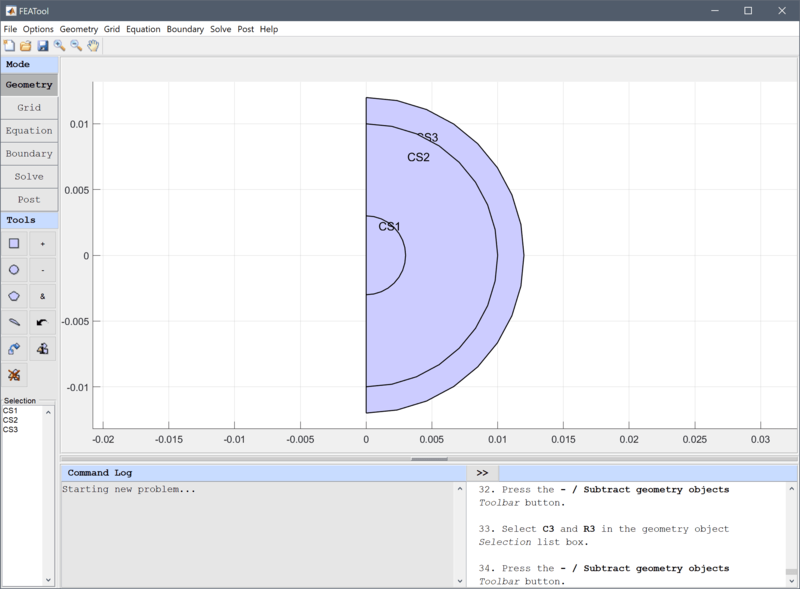 Select C3 and R3 in the geometry object Selection list box. Press the Equation mode button to switch from grid mode to physics and equation/subdomain specification mode. 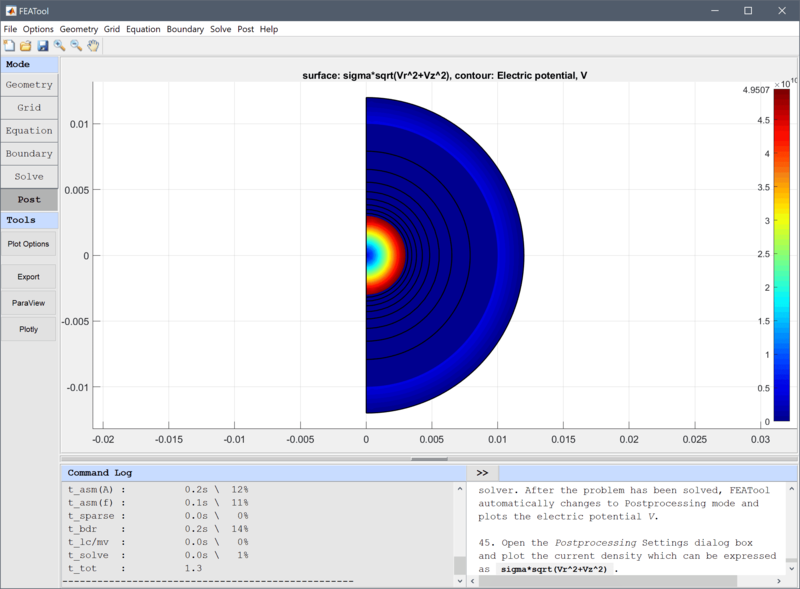 In the Equation Settings dialog box that automatically opens, select all Subdomains (1-3) and enter sigma+epsr*eps0/tscale for the Permittivity, ε, and rho/tscale for the Space charge density, ρ. 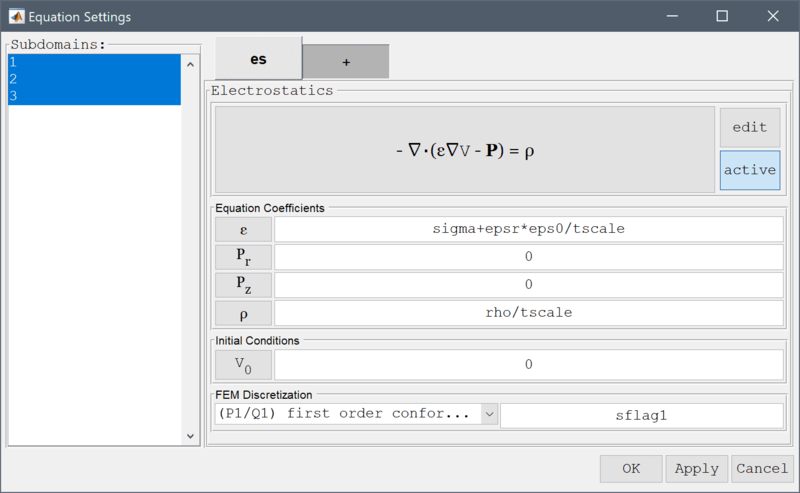 Press the Constants Toolbar button, or select the corresponding entry from the Equation menu, and enter the following variables for the capacitor parameters in the Model Constants and Expressions dialog box. 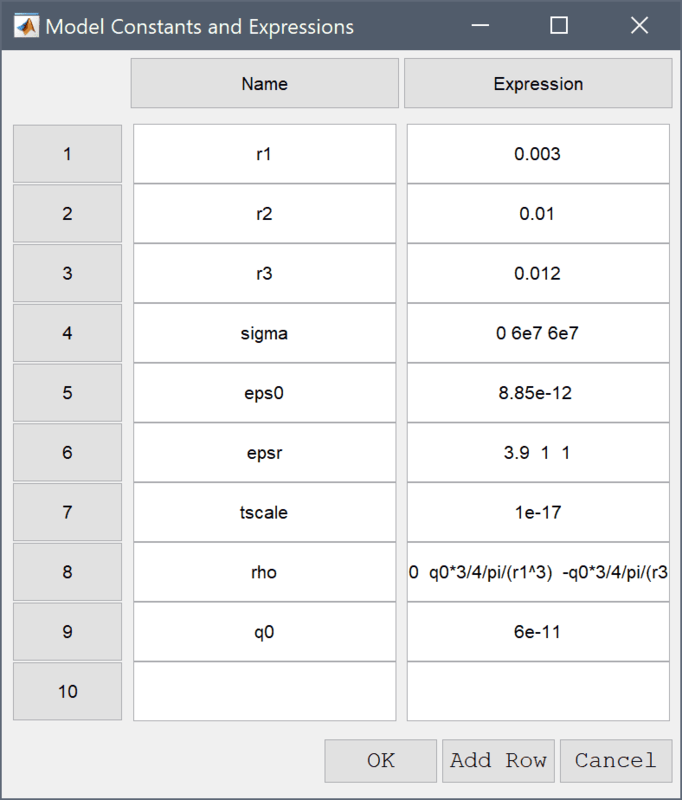 Press Enter after the last expression or use the Add Row button to expand the expression list. Also note that values for different subdomains are entered a a space separated list. Select 1, 2, 3, 6, and 7 in the Boundaries list box. 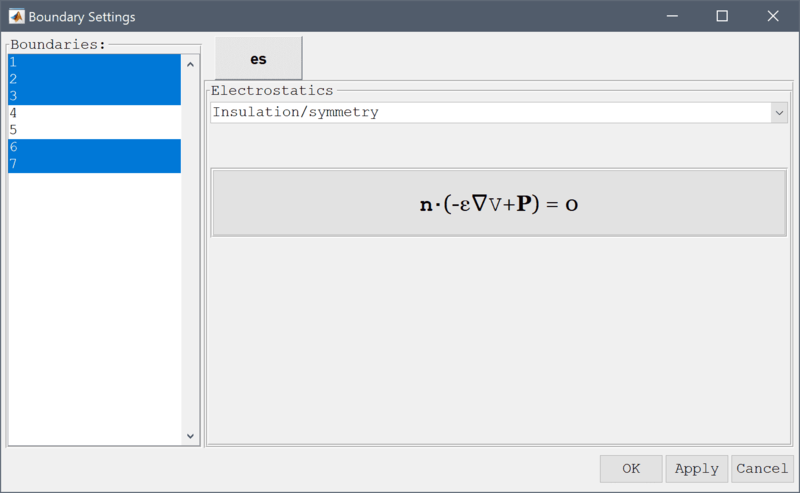 Select Insulation/symmetry from the Electrostatics drop-down menu. Select 4 and 5 in the Boundaries list box. 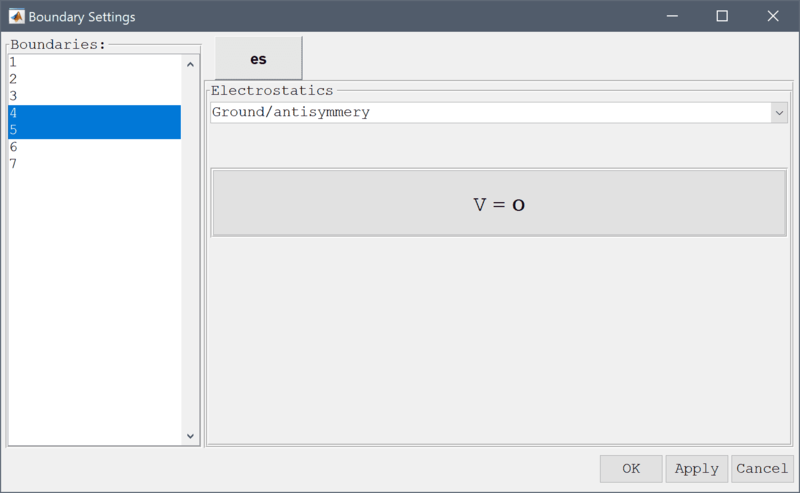 Select Ground/antisymmery from the Electrostatics drop-down menu. Switch to Solve mode by clicking on the corresponding Mode Toolbar button, and press the = Toolbar button to call the solver. 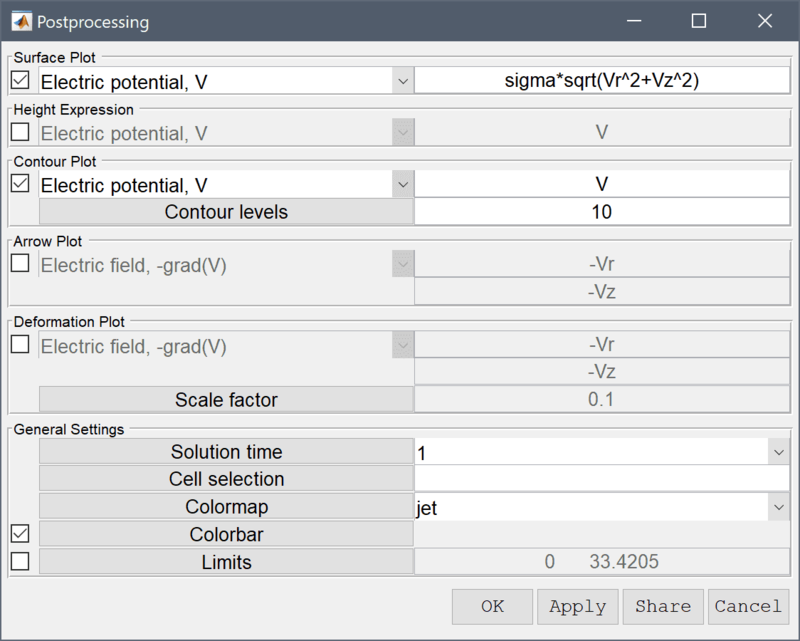 After the problem has been solved, FEATool automatically changes to Postprocessing mode and plots the electric potential V.
To verify the solution, one can calculate the capacitance as q0/( Vmax - Vmin ) where Vmax can be found by using the Min/Max Evaluation... option from the Post menu (Vmin will be 0). Enter q0/V into the edit field. 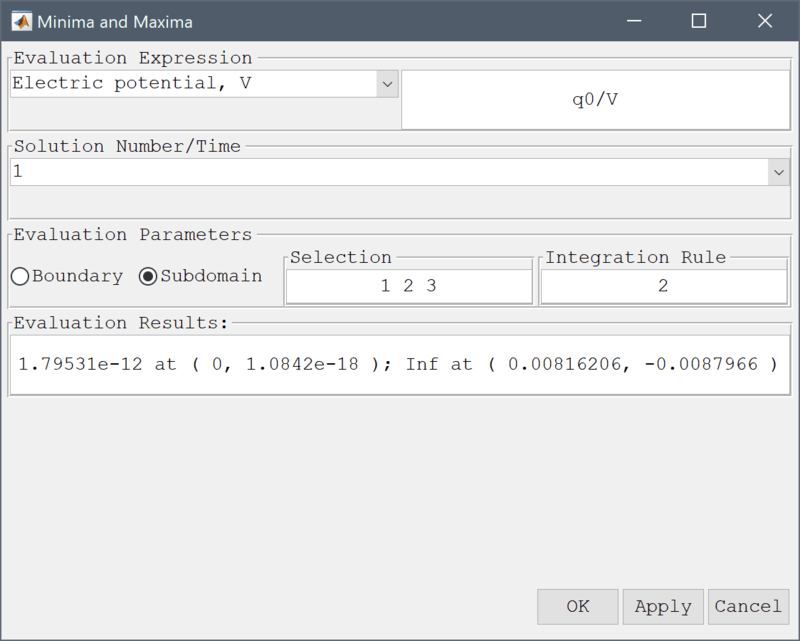 Alternatively, one can integrate the expression for the energy E = ε0εr(Vr2+Vz2)πr over all subdomains, where the capacitance then can be calculated as q02/(2·E). Compare the computed capacitances with the analytical expression 4*πεrε0/( 1/0.003 - 1/0.01 ) which in this example should be equal to 1.8588e-12. 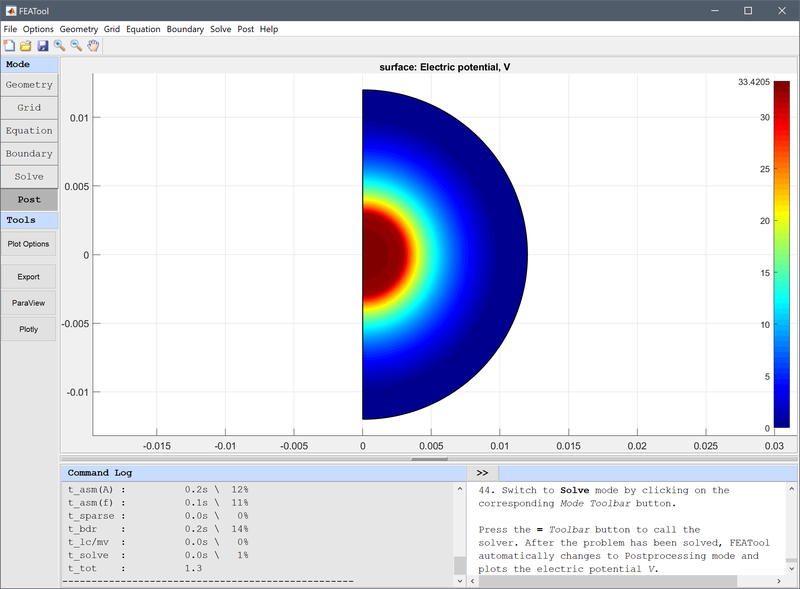 The spherical capacitor electromagnetics model has now been completed and can be saved as a binary (.fea) model file, or exported as a programmable MATLAB m-script text file, or GUI script (.fes) file.